Just wanted to thank you all for the most fantastic evening’s entertainment. We’re all Eagles fans and were knocked out by the quality of your performance. The sound was truly awesome (and I don’t use that word often!) It was a privilege to hear such accomplished musicians – and the singing was excellent. I loved ‘Wasted Time’ but it seems wrong to single out one track, they were all impressive. Many thanks and we look forward to your next visit. Blown away by the talent you all have. A privilege to be there. Please keep coming back. Thank you for yet another fantastic evening, you were amazing! Goosebumps all over and tears rolling down my face, great to hear the classic Eagles songs played and sung with such passionlove you guys! You guys absolutely stormed it. Great choice of solo cuts too. New York Minute was stunning. The whole thing flew by like a dream. 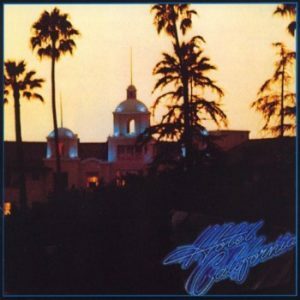 Hotel California is the fifth studio album by American rock band the Eagles, and is one of the best-selling albums of all time. The album became the band’s best-selling album after Their Greatest Hits (1971–1975), with over 16 million copies sold in the U.S. alone and over 32 million copies sold worldwide.